This article is based on a presentation with the title Pro Patria Mori—Cornish stained glass images of loss and remembrance given in Truro on November 11th, 2014 . The practice of inserting stained glass memorial windows in churches did not become popular until the early 1840 s. James Markland’s advocacy1 in 1842 that such windows were a more suitable alternative to stone monuments was part of a broader architectural response to the publications of the Oxford movement and the Tractarians. The Diocese of Exeter, which then included Cornwall, was one of the first to establish a Diocesan Architectural Society, and enthusiastically followed Markland’s advice. Figure 1. Beati mortui qui moriuntur in Domino (Blessed are the dead which die in the Lord) ( Revelation 14:13). The purpose of this article is to concentrate on the windows in Cornish churches dedicated to those who had died in war, and to establish that such windows are significantly different from the majority of normal memorial windows. War stained glass windows are also significantly different from public war memorials. From 1918 onwards, secular war memorial monuments were usually sited in public external spaces and were for communal memory. They usually depict either servicemen in uniform or allegorical figures. By contrast, stained glass war memorial windows are almost entirely sited in sacred internal spaces, the majority are for a single individual, and they show a much wider range of both sacred and secular iconography. 1914 – 1918 (The Great War) 35 of which 12 were inserted before the end of hostilities. Through using this fairly small sample, this article examines the ways in which the icography of Cornish windows shows changing attitudes towards the remembrance of those who have fallen in war, and so reveals shifts in cultural values in society. It would be interesting to see whether these findings are reflected elsewhere in the country. It must be remembered that the choice of subject-matter of such windows was a personal decision by grieving families or communities: the modern viewer is challenged to interpret the resulting iconography in that context. Figure 2. General Gordon in the memorial to Queen Victoria (n32) in the north nave aisle of Truro Cathedral. In his left hand he holds a copy of the bible. The earliest Cornish war memorial windows cover the wars waged throughout the British Empire in India, Egypt and South Africa. In 1902 , it was decided that the suitable nineteenth century icons to accompany Queen Victoria in her memorial window at Truro Cathedral were the Christian poet Tennyson and the Christian soldier General Gordon (Figure 2)5 Although only nine windows were inserted in this period, their iconography shows many of the themes and subjects that were later used to commemorate the fallen of the Great War. Figure 3. Ⅰ Sam C ⅹⅶ V ⅹⅼⅴ. Then said David to the Philistine, Thou comest to me with a sword, and with a spear, and with a shield: but I come to thee in the name of the Lord of hosts, the God of the armies of Israel, whom thou hast defied ( 1 Sam 17:45). Memorial to Capt William Frederick Thynne at Kilkhampton. Details in TRUROSEE catalogue. Kilkhampton:6 Capt William Frederick Thynne was killed at Lucknow in 1858 , and a Clayton and Bell memorial window of 1860 portrays nine Old Testament events of conflict, focusing on the actions of Joshua, Gideon and David (Figure 3). In sum, these images portray the pursuit of a just war against an enemy. Figure 4. Memorial to Lt Teignmouth Melvill, VC, at St Winnow. The central light shows the Resurrection. The angel in the left-hand light holds a scroll on which is written O death, where is thy sting? O grave, where is thy victory? ( 1 Cor 17:55) and the scroll held by the angel in the right-hand light reads But thanks be to God, which giveth us the victory through our Lord Jesus Christ ( 1 Cor 17:57). In the tracery above are, on the left, St Stephen, the first Christian martyr and, on the right, St Alban, the first British martyr. At St Winnow,7 a memorial window to Lt Teignmouth Melvill records the award of the Victoria Cross for his actions after the battle of Isandlana (sic) in 1879 . The main subject of this window is the Resurrection, but the tracery contains the images of the martyrs Stephen and Alban, implying a Christian subtext to his death (Figure 4). Figure 5. Memorial to those who died in the Egyptian campaign of 1882 – 5 at St Petroc, Bodmin. The figures are, from left to right, Saints Michael, Petroc, Piran and Longinus. St Petroc, Bodmin contains a number of windows commemorating the memory of members of the Duke of Cornwall’s Light Infantry over many campaigns. The window for the Egyptian campaign of 1882 – 5 8 introduces new themes to military memorials. St Michael defeating Satan signifies Good triumphing over Evil, whilst Longinus at the foot of the Cross marks the conversion of a soldier to Christianity. The other two images are of Saints Piran and Petroc, one of the earliest uses in stained glass of the Cornish saints (Figure 5). Figure 6. Memorial to those who died in the Boer War at St Petroc, Bodmin. The figures are, from left to right, Saints Martin, Maurice, Gerron and Longinus. Figure 7. Lower panel of the window shown in Figure 6. A cavalry battalion, supported by infantry, is shown overwhelming a defeated and retreating army. Two Cornish windows commemorate the Boer War. At St Petroc, Bodmin10, the regimental memorial window for the Boer War is the most ambiguous of all Cornish war memorial windows. The main lights show Saints Martin, Maurice, Gerron and Longinus (Figure 6). All were soldiers, and the middle two, in renouncing warfare, became martyrs for their faith. Both Martin and Longinus turned to peace when they accepted the Christian message. This is in complete contrast to the lower panels which depict one of the most graphic portrayals of an act of war in Cornish windows. A cavalry battalion, supported by infantry, is shown overwhelming a defeated and retreating army (Figure 7): a very powerful imperialistic image. It is difficult to reconcile this with the pacifist sentiments in the main section of the window. The second Boer War window is at Laneast11, where the Blessed Virgin Mary with child is shown flanked by St George and the patronal saint Sidwell. The dedication of this window is for the safe return from the South African War of three members of the Lethbridge family. A similar dedication beneath the Tinworth panel in Truro Cathedral marks the safe return of two sons of the High Sheriff of Berkshire. Within the space of a dozen years, such sentiments would never again occur after the scale of the casualties of the Great War. Indeed, one wonders at the appropriateness of such ‘memorials’ when at the other end of the cathedral, Frank Loughborough Pearson’s impressive Boer War memorial records the names of nearly three hundred Cornish servicemen who died in that war and who have no individual memorials (Figure 8). Figure 8. Memorial in Truro Cathedral to Cornish servicemen who died in the Boer War. This small sample of windows thus establishes some common iconographic themes that were used in pre- 1914 war memorial windows. The images used for both individual or group memorials encompass themes of the resurrection and judgement, of just wars and the triumph of good over evil, of the national saint and those saints associated with soldiering, and of patronal and Cornish saints. We shall now see how such themes were used in memorials to the fallen of the Great War, and some of the newer images that appeared from that conflict. Probably the most famous of the Cornish dead of the Great War was the Hon T (Tommy) CR Agar-Robartes. His memorial in Truro Cathedral is a focus during the annual service of remembrance, and there are two memorial windows to him in his estate church at Lanhydrock12. Both were installed in 1918 . North aisle 1 shows the women at the empty tomb with two guardian angels: the texts assert the certainty of resurrection and a life after death. North aisle east is more complex. Three archangels are portrayed, Gabriel, Michael and Raphael. The three predellas below show the appearance of angels to Daniel, Joshua and Elijah, so establishing a typological relationship. Both windows place angels central to the act of memorial. Figure 9. To the greater honour of God & in loving memory of Lieutenant Arthur Donald Sowell 7th Battalion D.C.L.I. who fell in action in the Battle of the Somme Augst 24th 1916 aged 21. Memorial in All Hallows, Kea. On the left is St Michael and on the right is St George. Each is slaying a dragon. A selection of the traditional images used to commemorate fallen soldiers includes Saints Michael and George at All Hallows, Kea (Figure 9)13, and Saints Michael and George with the Archangel Raphael (usually associated with healing) at Rame.14 The Sawle memorial at Porthpean comprises three separate windows showing King David, Saints Michael and George.15 Archangel Gabriel, Saints Michael and George are the subjects of the Williams memorial at Lanreath16, whilst his name is included on the memorial elsewhere in the nave to the eighty men of Lanreath who were killed (the officers are marked out in red lettering). Figure 10. To the glory of God and in loving memory of Sec. Lieut J.P. Gilbert 1st Hampshires who was killed in action in France on April 11th 1917 aged 31 years. A man greatly beloved. May he rest in peace. Memorial in St Paul, Chacewater. The angel holds a tablet on which is written Greater love hath no man than this that a man lay down his life for his friends ( John 15:13). The use of photographic images for the painting of the faces of the dead commemorated in stained glass windows began as early as 1850 , but became commonplace for the fallen of the Great War. At Chacewater, 2Lt JP Gilbert is shown in uniform at the foot of the cross (Figure 10)17, whilst at Treverbyn the kneeling Charles Treverbyn-Gill is at prayer at the foot of the Cross18. Figure 11. Memorial in St Martin by Looe to Lt Robert Picken, RAF. Often the soldier is also portrayed in medieval armour, as at St Martin by Looe, where the Picken memorial shows Christ presenting a crown to the armoured soldier, guarded by Longinus, and comforted by his mother. Both soldier and mother are shown by photographic likenesses (Figure 11)19. There is a similar personalised image of a medieval knight at Saltash in the Pym memorial (Figure 12)20. Figure 12. To the Glory of God and in dear Memory of John Scarlett Pym DCM Scout Sergeant Royal Canadian Dragoons afterwards Second Lieutenant The Queen’s Regiment Killed in Action on the River Somme 3rd December 1916 only Son of Flora and Walter HJ Pym Payr Captain Royal Navy. Memorial in St Nicholas and St Faith, Saltash. The banners at the top of the outer lights read Be thou faithful unto death and I will give thee the Crown of Life ( Revelation 2:10). The majority of Great War memorial windows are for individuals (almost always officers), but some do commemorate all the servicemen from the parish who were killed. At Lelant, Saint George slaying the dragon is the main image commemorating the Lelant men , and besides the Royal standard there are further insignias for Cornwall and the Diocese of Truro. Figure 13. To the glorious memory of the men from this parish who fell in the war 1914 – 1919 R.I.P. Memorial in St Gennys. The scene shown is Noli me tangere (Touch me not) ( John 20:17) with Mary Magdalene before Christ in the garden after the Resurrection. At St Gennys, the men from this parish are remembered by the image of Noli me tangere with Mary Magdalene before Christ in the garden after the Resurrection (Figure 13). Requiescant in pace (May they rest in peace). Pro Rege et Patria (For King and Country) 1914 – 1918 . Figure 14. Memorial at St Just in Penwith to all the members of the parish who died in the Great War. A remarkable collective window is at St Just in Penwith, where thirty-eight members of the parish are listed, with the arms of the Cornish regiments. The main image is of the Crucifixion, but the soldier at the foot of the Cross is an ordinary British Tommy (Figure 14). Figure 15. Memorial in St Petroc, Bodmin, showing a wounded soldier with his rifle and helmet, kneeling at the foot of the Cross. The only other window where the ordinary soldier is portrayed is in the 1914 – 18 regimental window at Bodmin (Figure 15). The wounded Tommy with his rifle kneels at the foot of the Cross, which is flanked by images of Saints Guron and Dennis. The predellas below show the main religious buildings in four areas of battle—Ypres, Merville, Arras and Albert. Finally, there are three Great War memorial windows in Cornwall that deserve closer attention. Each in its own way presents a fresh approach to the sense of loss, grief and remembrance compared to the windows already listed. Figure 16. The Bolitho memorial in Paul parish church in memory of Lt William Torquill Macleod Bolitho, portrayed as Sir Galahad. The first is the chancel east Bolitho memorial at Paul parish church, designed by Robert Anning Bell in 1917 . In terms of design, technology and artistic ambition this remarkable window is one of the most significant Arts and Crafts windows in the Southwest, but for present purposes our attention is concentrated on the iconography. The tracery consists of charming young angels playing musical instruments—a signature Bell motif signifying innocence. The main subjects in the five lights below contain the most complex imagery. The panels in the three main lights show the soldier as Sir Galahad, leading a horse, and surrounded by angels (again mostly young) (Figure 16). The photographic likeness of the knight identifies the dedicatee as Lt William Torquill Macleod Bolitho, who died in the second battle of Ypres, 1915 . The outer lights contain six panels of intertwined motifs surrounding young angels again, with indicators of Bolitho’s military career (Ypres, Hooge, Cornish arms, military insignia, etc.). Below these panels is a coastal seascape, extended across all five lights, which has been read as the view of the western Lizard peninsular as viewed from the churchyard of Paul church. If all this were not enough, the heads of the five lights contain the window’s unique feature, namely a detailed view of the battlefield on which Bolitho lost his life. The scene includes roads, buildings and the lines of the opposing armies (Figure 17). Figure 17. Detail from the top of one light of the Bolitho memorial in Paul parish church. RM Paul, Chancellor to the Diocese, 27/04/1918 . One cannot but conclude that the Bolitho window at Paul was one that caused the Chancellor to make such a strong comment. Figure 18. 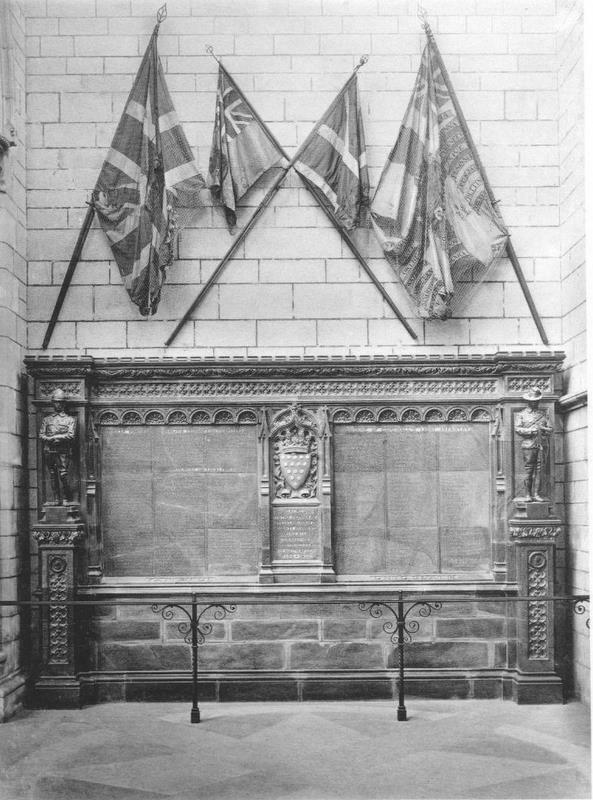 Memorial in the chapel of Launceston College to former pupils who died in the Great War. The second remarkable and particularly poignant Great War memorial window was inserted in the chapel of Launceston College22. The main central light under the sign Pro Patria lists the names of twenty-nine former pupils who fell in the Great War. On either side are the images of St George ( Patron saint of England and of soldiers ) and St Nicholas ( Patron saint of sailors and schoolboys ). In the panels above are sadly faded allegorical representations of Art, Literature, Music and Mathematics (Figure 18). This sad and affecting window is now without its chapel context but is still a powerful expression of the sense of loss of the potential of those that did not survive. The same can be said for the memorial window in what was the old Truro cathedral choir school where, beneath images of Gabriel and St Michael, are listed the names of nineteen ex-pupils who were killed in the Great War. Figure 19. Memorial in St Stephen-by-Launceston. The final window in this section on the Great War is the chancel east window at St Stephen-by-Launceston23. The tracery is full of music-playing angels and texts of various virtues such as Peace , Justice , Mercy and Love . This sets the tone for the five main lights. The central one is a standard representation of St Michael, but the other four successively portray War, Devastation, Peace and Plenty (Figure 19). This is a rare example of a war memorial window (the dedication is simply to the fallen ) which looks beyond the harrowing aspects of the recent conflict towards the prospect of a better future, introducing a reflective element into Great War memorial stained glass windows that is quite unique in Cornwall. Figure 20. Memorial in Egloshayle to ten parishioners who died in the Second World War. In this very small sample, some of the common iconography from the Great War windows was still being used after 1945 . At Egloshayle24, a communal window for ten parishioners who died in the war repeats the images of Saints Michael and George (Figure 20). Similarly, at Lelant25 a kneeling soldier before Christ receives a crown from an angel in a communal window for six named parishioners. Interestingly the tracery contains two images of sacrificial iconography, namely the Agnus Dei, but also the much rarer Pelican in her Piety, a common image up to the end of the nineteenth century but rarely used in the twentieth. Figure 21. The Communion of Saints. Memorial in All Saints, Millbrook showing Christ in Majesty in a Te Deum setting. The arms in the tracery on the left-hand side are of the Diocese of Canterbury and, on the right-hand side, the Diocese of Truro. Millbrook has a communal window showing a typical Christ in Majesty in a Te Deum setting. Amongst the groups of service personnel (male and female), however, are members of the civilian services for the first time (Figure 21). Also the tracery, besides the arms of the Canterbury and Truro sees, also contains the Agnus Dei and the Pelican in her Piety again. Figure 22. Detail from the memorial window at St Stephen-in-Brannel, showing a potter working in his studio. Figure 23. Detail from the memorial window at St Stephen-in-Brannel, showing a housewife preparing a meal in a contemporary ( 1940 s) kitchen. St Stephen-in-Brannel has a most remarkable communal window that really pushed traditional iconography farther that anything up to this time. The central lights of this four-light window are dominated by a Last Supper with the Agnus Dei below, together with the Peacock, symbols of sacrifice and resurrection. The outer panels contain three images of local industry, whose themes link back to the events of the Last Supper. To the left are scenes of the china clay extractive sites, whilst to the right are scenes of crop farming. The final panels at the bottom both contain images of the return to normality after warfare. The potter is working in his studio whilst the housewife is preparing a meal in a modern ( 1940 s) kitchen (Figures 22 and 23). Like the earlier post- 1918 window at St Stephen-by-Launceston, there is a reflective element in this window that makes it stand out from the normal war memorial windows of its time. Figure 24. Per ardua ad astra (Through adversity to the stars). De profundis clamavi (Out of the depths have I cried [unto thee, O Lord]) ( Psalms 130:1). Memorial at St Eval to the servicemen of Coastal Command. At the bottom left is the badge and motto (Constant Endeavour) of RAF Coastal Command and at the bottom right is the badge and motto (Faith in our Task) of RAF St Eval, which incorporates a picture of the church. St Eval’s memorial to the Coastal Command servicemen who lost their lives in the Second World War is the most powerful of all Cornish war memorial windows, using a totally different artistic style and iconography. The badges of RAF Coastal Command and RAF St Eval are included together with the RAF motto Per ardua ad astra (Figure 24). The main image is of a red crown of thorns for sacrifice, surmounted by the Alpha and Omega, and the five wounds of Christ as red dots at the head of each light. In the tracery, stars gleam in a dark night over the Atlantic (a wondrous use of varied blue antique glass). Beneath the crown is the suggestion of a gigantic wave with the inscription from Psalm 130—De profundis clamavi (Out of the depths have I cried [unto thee, O Lord]). It is fitting that this, hopefully, final war memorial window in Cornwall should be such a deeply artistic and moving contribution on the price of war in human suffering. Conclusion: remembering loss, suffering and sacrifice. Figure 25. To the memory of Captain PERCY ASHTON, M.C., who served with the 1st. & 8th. Battns. D.C.L.I. in France & Salonika 1914 – 1918 and died from the effects of War Service 18th. September 1934 . Memorial at St Petroc, Bodmin. To bring this survey of Cornish war memorial stained glass windows to a close, we return to St Petroc, Bodmin, where in the north chapel east a late First World War window was inserted in 1936 29 The tracery shows the crucifixion with Mary and John. The main images are from the legends of Arthur and Percival, and the English Christian kings Richard Ⅰ and Edward Ⅰ. Thus once again the chivalric sacrifice from the legends of the Round Table and medieval times is linked to the waging of just wars. The inscription for one of the dedicatees, Captain Percy Ashton, highlights the suffering that results from all wars: who served with the Duke of Cornwall’s Light Infantry in France and Salonika, 1914 – 1918 , and who died from the effects of War Service, 1934 (sixteen years after the end of hostilities): A man courageous, courteous, kind, Through suffering of steadfast mind (Figure 25). The other dedicatee is Maj Gen Sir John Inglis who commanded the garrison at the siege of Lucknow in 1857 , which takes us neatly back to the first Cornish war memorial window at Kilkhampton. We have seen that the particular nature of war memorial windows in a sacred setting, whether they commemorate an individual or group, produced a range of iconography that separates such windows from all other church memorial windows and secular war monuments. Some iconographical themes remain constant over one hundred and fifty years, particularly the emphasis on suffering, sacrifice (Crucifixion) and the certainty of resurrection (Christ in Majesty, and archangels) and the triumph of good over evil (Michael and George). Patronal (often Cornish) saints and Cornish images reinforce the geographic location of these windows. On the other hand, some iconographic themes evolved as society and culture values changed over time. Personalising the dedicatee by the use of photographic images came and went. The imperialist overtones of the pre- 1914 windows, together with the ‘safe return’ dedications vanished with the horror of the Great War. The images of medieval chivalry and sacrifice hardly bore comparison with the brutal mechanised killing of 1914 – 18 . Gradually, the subjects of some windows turned to the prospect of peace after warfare, and the return to civilised normality and a better future. The common feature of so many of these windows is the overwhelming sense of grief and the loss of young lives, and this again marks the difference between ordinary memorial windows and war memorial windows. In the former, the usual donors are the children and the dedicatees are the parents. In war memorial windows, the reverse is true—parents are grieving for children30. If sometimes the iconography of war memorial windows can seem repetitive, one must remember that the sense of remembrance was particularly raw to the members of the donor family, and the windows were not only an act of remembrance of the dedicatee but also one of consolation for the donors. Thus both Saints Michael and George portray Evil defeated by Good. In addition, Michael (and Resurrection themes) promised a life after death, whilst George’s role as patron saint of England endorsed personal sacrifice in the cause of a just war . Ultimately, these contrasting responses to the subject of war and its effects must be irreconcilable. As we have seen, these tensions are in the Cornish war memorial windows and they are shown in the contrast between typical war memorials with a grieving soldier with reversed arms compared with the 1920 s triumphal memorial in Truro’s Boscawen Street. What is undeniable even today is the emotional impact of such memorials and acts of remembrance. 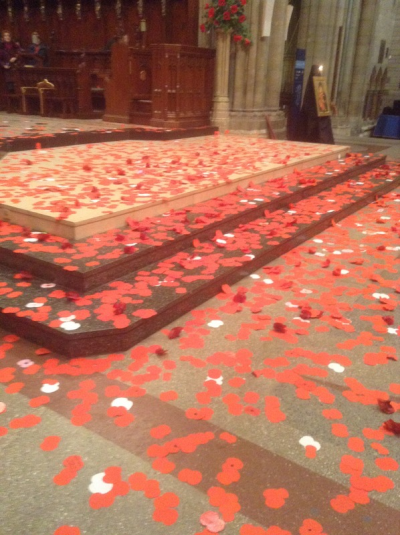 A final, telling image (Figure 26) is that of ten thousand poppies (one for each Cornish serviceman killed or missing in the Great War) falling from the crossing in Truro cathedral at the eleventh hour of the eleventh day of the eleventh month, 2014 . Figure 26. 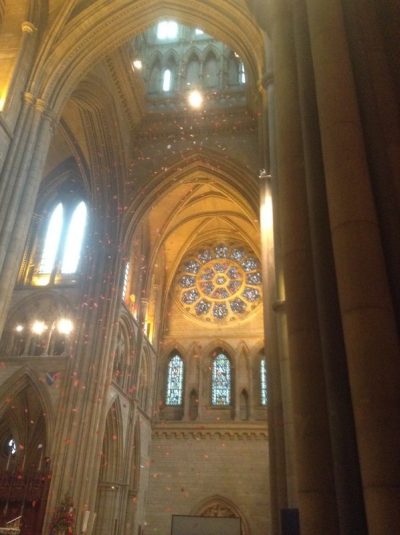 Ten thousand poppies falling from the crossing in Truro Cathedral at the eleventh hour of the eleventh day of the eleventh month, 2014 . JH Markland, Remarks on English churches, and on the Expediency of Rendering Sepulchral Memorials Subservient to Pious and Christian uses . Oxford, 1842 . Revd John Armstrong, Transactions of the Exeter Architectural Society . 1843 . Lostwithiel: north aisle east and north aisle 1, inserted in 1841 , donated by Revd John Bower and manufactured by William Wailes of Newcastle. Michael Kerney, The Victorian Memorial Window, Journal of Stained Glass , Vol ⅩⅩⅩⅠ ( 2007 ), pp 66–93. British Society of Master Glass Painters. Michael G Swift, Piety, Power and Pride, 2015 . Michael G Swift, The windows of Truro Cathedral, Chapter 12, 2014 . Kilkhampton: tower west, made by Clayton and Bell, inserted in 1860 in memory of Capt William Frederick Thynne. Details in TRUROSEE catalogue. St Winnow: Lady chapel south 2, inserted 1880 in memory of Lt Teignmouth Melvill, VC. Bodmin: inserted 1886 and made by Clayton and Bell. Bodmin: north aisle 2, made by Clayon and Bell, inserted in 1903 . Laneast: south aisle east, inserted 1902 . Lanhydrock church: north aisle 1 and north aisle east, inserted in 1918 . All Hallows, Kea: north nave 2, made by Heaton, Butler and Bayne and inserted in 1917 , in memory of Lt Arthur Donald Sowell who died at the Somme in 1916 . Rame: north transept east, inserted in 1917 . John Robert Ware Elkins killed in 1917 , and the RAF insignia is included in the tracery. Porthpean: chancel north, nave north 1, and west. All inserted 1918 and made by Clayton and Bell in memory of Lt Richard Charles Graves Sawle. Lanreath: south aisle 1, inserted in 1924 in memory of Arthur Trestain Williams. Chacewater: south aisle 2, inserted 1917 in memory of 2Lt JP Gilbert. Treverbyn: north aisle 1, made by J Wippell of Exeter, inserted in 1922 in memory of Charles Treverbyn-Gill. St Martin by Looe: north nave 1, made by William Morris of Westminster, inserted in 1920 in memory of Lt Robert Picken, RAF, shot down in an air fight off the coast of Albania, 6th September 1918 . In the tracery is an image of a Bristol F2B fighter plane. His mother donated the window and died in the ensuing months before the window was inserted. Saltash: south aisle 2, made by William Morris of Westminster, inserted in 1920 in memory of 2Lt John Scarlett Pym. RM Paul, Truro Diocesan Magazine 1918 , June 1918 , p 110. Launceston College: made by William Morris of Westminster and inserted in 1920 . St Stephen by Launceston: made by Percy Bacon Bros and inserted in 1920 . Egloshayle: north nave 1, by John Hall of Bristol, inserted 1953 . Lelant: north aisle 2, inserted 1949 . St Stephen-in-Brannel: chancel east by George Cooper-Abbs for Wippell of Exeter, inserted 1946 . St Eval: south aisle east by Crear McCartney, inserted 1989 . Bodmin: north chapel east, by AK Nicholson, inserted in 1936 in memory of Captain Percy Ashton and Major General Sir John Inglis. The usual wording on French war memorials is Aux enfants de … morts pour la patrie. .
Lawrence Binyon, For the Fallen . Wilfred Owen, Dulce et decorum est .